Book Review: “Chance and the Sovereignty of God” by Vern Poythress | J.W. Wartick -"Always Have a Reason"
When I saw the title Chance and the Sovereignty of God: A God-Centered Approach to Probability and Random Events, I pounced on the opportunity to review it. This is a topic I’ve been considering for doctoral work so I was extremely excited to dive in. The book starts off well, with discussions on the nature of chance and exploration of the biblical material for anything dealing with seemingly random events. Poythress ably shows that the Bible clearly presents God as in control of all these events. Numerous verses suggest that God is in control over “all” events, while verses which explicitly mention seemingly random or chance occurrences also attribute such events to divine knowledge and control. Poythress’ look into these topics is detailed and broad. He addresses the weather, random events like the toss of a die, human free choices, the life and death of the smallest creature or plant, and even gambling! These things are all argued to be ultimately, biblically under the sovereignty of God. Chance as an explanation, Poythress argues, is ultimately empty. For chance is substituted to become whatever we cannot predict or explain, and is then used itself as the explanation. I found Poythress’ comments here interesting and very insightful. His application of this concept to other worldviews later in the book makes it worth the read for these sections alone. One difficulty with the book is the question of audience. At times, the discussion of probability theory becomes complex and very scholarly, but the earlier sections of the book speak broadly and with words that seem aimed more at a general readership. This mixture of technical and general writing makes it hard to pinpoint the audience. Who is supposed to read this book? What is it supposed to be used for? Poythress does make some earlier references to this argument, but it just never seems to be fully established and surely a statement about mathematical separations for probability in the world being a reflection of distinction among persons in the Trinity may cause some skepticism. It is a point which begs for more argumentation than was dedicated to it here. Where Poythress does address it (Chapter 11), we find more detail to the arguments, but even more questions left unanswered. For example, granting that God is revealed in all things which are made, why think that a sequence of flipping coins is explicitly a revelation of the Trinity instead of simply a revelation of God’s imbuing the universe with order and regularity so that seemingly random events are possible? But Poythress takes it as the former–a revelation of the Trinity–without so much as a comment on alternative possibilities. Perhaps more problematic is that Poythress never seems to tackle the broader implications of his biblical argumentation. Yes, he put much work into showing God is sovereign over the weather, chance events, free will, and the like. But I kept thinking, “And now what?” What does it mean to say God is in control over natural disasters? What does it mean to say that the roll of dice I make in a game of Risk, for example, is controlled by God? What are the implications of the biblical data Poythress has set before me? Topics like these are taken up at points, only to be quickly set aside by a paragraph or even just a sentence or two. Overall, Chance and the Sovereignty of God is an interesting look at an oft-neglected topic, but its scope is too broad and its argumentation at times too vague to be helpful. On biblical issues Poythress has offered much to consider. His outline of probability theory is helpful but technical. What I found after reading the book is that I continued to hope for a more detailed discussion on how sovereignty would interlink with chance. Yes, the book makes it plain that God has sovereignty over seemingly random events, but exactly how does that work? What does that mean for everyday life? At times these topics are taken up, only to be set down after but a few sentences. At times helpful and stunningly insightful, at other times frustratingly vague and broad, it’s a book that will leave you longing for more. 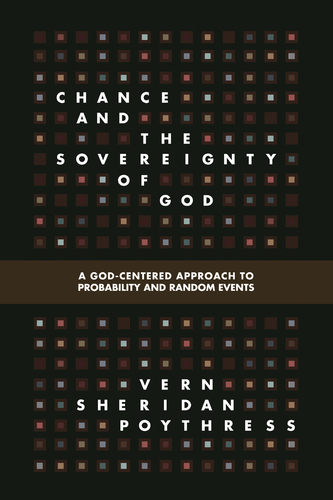 Vern Poythress, Chance and the Sovereignty of God: A God-Centered Approach to Probability and Random Events (Wheaton, IL: Crossway, 2014). Thanks for your comment, Joel! I appreciate the insight. I have read three books from Poythress now and have found them all to be on this same borderline between insightful and frustrating. As you said, it seems the case is made, but then nothing is said after that. One gets handed a doctrine or an overarching framework with extremely broad application, but then must come up with those applications on one’s own. I have not read the book, and I know I will to have time to (my stack is hundreds deep and my wish list will require a few lifetimes!). Just a few comments anyway………..
1. I wonder if JW misses the point f this book? There is a complaint that the book is too broad and too vague to be helpful. And there’s a complaint that Poythress does not draw out practical implications. I doubt it was the authors intention to go beyond the theoretical. Bringing in the realm of application would surely make the book “broad” and impossibly long. I recently read a book that is just that: a ore practical look at God’s sovereignty in the affairs of chance events with an emphasis on pain and suffering (Randy Alcorn’s “If God is Good” http://www.amazon.com/If-God-Is-Good-Suffering/dp/160142132X/ref=sr_1_10?ie=UTF8&qid=1402060380&sr=8-10&keywords=randy+Alcorn). That required almost 600 pages (and it as a really great book for an application of these topics to our lives). But Alcorn could not begin to address the philosophical and theoretical foundations as that as not the purpose of that book. 2. Fascinating points about how often atheists use the “Chane of the gaps” argument. When chance is not a casual agent but only a word for what we cannot explain. I see that all the time on blog replies written by atheists. It’s as useful as “Mother Nature”, Multiverses, or other forms of magic that atheists conjure up. 3. Was there any mention of the “Middle Knowledge” of God, whereby God has prior knowledge of all events? Wm. Lane Craig uses that argument to resolve the predestination/ free will dilemma and I think it would be quite pertinent to the topic of chance and God’s sovereignty. 4. Re. the doctrine of the Trinity as a paradigm for how God’s is revealed in the world, Dorothy Sayers’ “The Mind of the Maker” is a great resource. Sorry for the long reply……. I always read JW Wartick and think this blog is one of the most reliably intelligent and well written anywhere. Thanks for the work JW. I skim most of the others, but I almost always know and trust that this blog is worth copying and reading carefully. Sorry for the delayed response. Thanks so much for your comment! Thanks also for reading and your very kind words about this blog. I think that the comment by Natural Historian also brings out the same things I was saying. To be honest, the book would not have to be any longer at all. Instead, they could simply edit out the dozens of pages dedicated to probability theory and interlaced with “God did it” type comments, and instead replace it with on-topic comments about how, exactly, chance relates to sovereignty. Clearly, the book attempts to hint at application, but it is often only hinted at and never even argued for. I think you’d really have to read it in order to level these kind of critiques against the review, particularly because from response so far, others agree about the writing style. This is something I experienced with Poythress in his “Inerrancy and Worldview” book as well. It was all very, very base-level without any exposition at all. Similarly, many of the comments in this book are pretty straightforward: the Bible says x, therefore x. That is a very important exercise, but having over a hundred pages of a book dedicated to it, and then simply importing a whole two sections (and several appendices) to probability theory doesn’t make the book feel focused or even, at times, helpful. There are many good insights, as I noted (like the comments about worldview and chance), but these were in between at times tens of pages of what felt, for lack of a better word, like filler. I do not recall a single reference to middle knowledge, though I’d be happy to be corrected. Yikes, I need to correct my spelling and grammar before sending comments – apologies for all the errors. Fair enough J.W. I really need to read the book.